Daniel B. Cornfield : Beyond the Beat: Musicians Building Community in Nashville.Princeton, NJ: Princeton University Press, 2015. 218 pp. $35.00, hardcover. Drawing on rich interviews with 75 music professionals in Nashville, Cornfield develops both a typology of artist activism and a theory of its genesis. He distinguishes among three types of artist activists: “enterprising artists” produce their own and others’ music and mentor early-career artists; “artistic social entrepreneurs” create social spaces, such as schools and performance venues, that promote professional development; and “artist advocates” reshape unions to meet the needs of independent musicians. The majority of the book—four out of seven chapters—is dedicated to deep introductions of 16 individuals who exemplify these types. From Tina, a Nashville native in her late teens who is dedicated to her Asian–European multiethnic identity and her musical authenticity, to Rick, a union activist who has lived in Nashville since the 1950s, we learn about these music professionals’ artistic visions, audience orientations, and beliefs about risk. These individual perceptions, contends Cornfield, explain the emergence of artist activism but have thus far been largely neglected by a literature overly focused on structural and institutional factors. Members of the artist community who conceive of success as artistic freedom and who think of their peers as their audiences, he argues, are most likely to become artist activists. How they understand risk—whether as attributable to the individual, a product of interpersonal relationships, or a property of the market—determines what type of activists they will become. This typology and theory of artistic activism is both elegant and useful. It provides the analytical clarity necessary to disentangle what would otherwise seem like an organic hodgepodge of loosely interdependent musical professionals into its constituent components, and it points to the necessary conditions for the emergence of artist activism. As Cornfield concludes, cities dense with music producers and consumers are more susceptible to activism-oriented artists coalescing into a community of the kind that emerged in Nashville. I wonder, however, where the individual orientations that catalyze artistic activism come from and whether they precede activism, as Cornfield suggests, or cohere retroactively as narratives that activists tell themselves about their experiences. If the latter, then other factors are necessary to piece together the puzzle of Nashville’s musical community. You can read the full book review published in Administrative Science Quarterly free for the next two weeks by clicking here. Want to keep current on all of the latest research published by Administrative Science Quarterly? Click here to sign up for e-alerts! You can also follow the journal on Twitter–click here to read recent tweets from Administrative Science Quarterly! You can also read additional blog content for Administrative Science Quarterly content from the ASQ Blog, as well as Editor Henrich Greve’s blog, Organizational Musings. Xabier Itçaina, Antoine Roger, Andy Smith : Varietals of Capitalism: A Political Economy of the Changing Wine Industry. Ithaca, NY: Cornell University Press, 2016.280 pp. $45.00, hardcover. The empirical story analyzed in Varietals of Capitalism concerns the events surrounding the 2008 decision of the European Union to significantly change the regulations governing the wine industry in Europe. Since that year, the EU has abandoned direct intervention in wine markets (the old and long-established policy was to subsidize distillation surpluses), used EU funds to “grub out” 175,000 hectares of uneconomical vines across Europe, revoked laws that prohibited specific techniques for wine production, and created simplified categories of wine. Using primarily qualitative data—documentary materials and interviews—collected from France, Spain, Italy, and Romania, the authors provide an account of these very significant institutional changes. The empirical story, however, is only the context for the authors’ primary purpose, which is to showcase a holistic theoretical framework that, they claim, “draws not only on original empirical research but also, more fundamentally, on a new standpoint in social science debates about economic change” (p. 2). As the authors put it, “our focus is on the efforts a wide range of socially structured actors make to build, maintain, dismantle, or even destroy the institutions that provide them with varying degrees of order and constraint” (p. 32). The framework that they offer (rather unfortunately named the “structured contingency” approach) “combines the tools of constructivist approaches to institutionalism . . . Bourdeau’s theory of fields . . . and a Weberian sociology approach to political work in industries” (p. 2). In presenting their framework, the authors repeatedly point out its superiority to four alternatives: actor network theory, sociological institutionalism, institutionalist economics, and regulationist economics. (A fifth alternative, historical institutionalism, is also mentioned.) “Put bluntly,” these “major theory-driven interpretations of change in the European wine industry are incomplete or wrong” (p. 4). So, no false modesty here! You can read the rest of the book review published in Administrative Science Quarterly free for the next two weeks by clicking here. Want to stay up to date with the latest research published by Administrative Science Quarterly? Click here to sign up for e-alerts! You can also follow the journal on Twitter–click here to read recent tweets from Administrative Science Quarterly! You can read additional blog content for Administrative Science Quarterly content from the ASQ Blog, as well as Editor Henrich Greve’s blog, Organizational Musings. 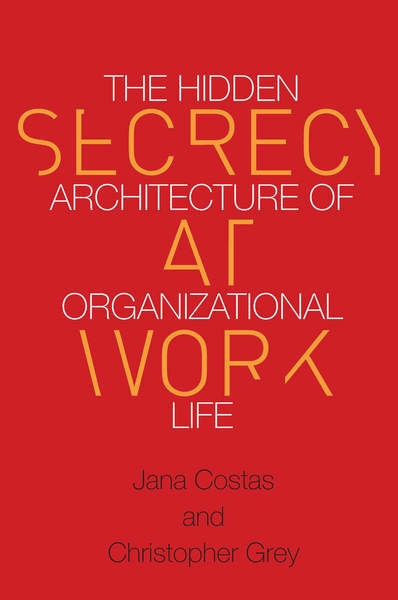 Jana Costas, Christopher Grey : Secrecy at Work: The Hidden Architecture of Organizational Life. Stanford, CA: Stanford University Press, 2016. 202 pp. $27.95, paper. In their provocative new book, Jana Costas and Christopher Grey focus not on organizational secrets per se, the content that is concealed, but on organizational secrecy, “the processes through which secrets are kept” (p. 7). Note the plural in “processes,” as the dynamics and their ramifications can become quite complex. The authors’ goal, which they amply meet, is to bring secrecy out from the shadows, as it were, and convince the reader that it warrants far more scholarly attention as both an important topic in its own right and as a complement to management topics such as leadership, organizational change, and politics. The book’s subtitle, “The Hidden Architecture of Organizational Life,” speaks to their core argument: that secrecy explicitly and implicitly creates a compartmentalized structure linked by narrow corridors, a machinery for surveillance and monitoring, and organizational norms and professional ethics codes, all coupled with processes for sharing and not sharing information. “Like electricity or water in buildings, secret knowledge must always be penned in to proscribed places and forced to flow around prescribed routes” (p. 140). You can read the rest of the book review from Administrative Science Quarterly free for the next two weeks by clicking here. Want to keep current on all of the latest research published by Administrative Science Quarterly? Click here to sign up for e-alerts! You can also follow the journal on Twitter–click here to read recent tweets from Administrative Science Quarterly! Reich’s main focus is on the institutional legacies that shape how the people working in his cases reconcile the contradictions between their non-economic values and market pressures. The former public hospital’s contradiction is between the scarcity of resources and the practice of providing extensive uncompensated care to underinsured and uninsured patients. The people in this hospital view care as a social right, and Reich interprets their disregard for efficiency and profitability as rebuffing market pressures. In the Catholic hospital, the contradiction is between the values of sacrifice and dignity, with which many in the hospital identify, and management’s marketing of these values to attract high-paying patients, the treatment of uninsured patients with little dignity, and the lowest wages for nurses and ancillary workers among the three cases studied. Reich interprets this case as moralizing market pressures. In the integrated health management organization, customized care according to each patient’s special needs contradicts the organization’s prevailing operating principle of standardizing and rationing care by scaling up efficient practices. Reich interprets this case as taming market pressures through the use of bureaucracy and big data. The author lays out these three types of moral–market relationships by examining the conception of care, the structure of physicians’ work, and the power and division of labor between physicians, nurses, and ancillary workers including the role of labor relations in each of the cases. Another interesting argument in the book is that these three different moral–market relationships correspond to three different historical periods. I find Reich’s well-grounded discussion and critique of the three models highly persuasive. If you’d like to read the full review from ILR Review, you can click here to access the book review for the next two weeks. Interested in staying up to date with all the latest content published by ILR Review? Click here to sign up for e-alerts! Diane E. Bailey, Paul M. Leonardi : Technology Choices: Why Occupations Differ in Their Embrace of New Technology. Cambridge, MA: MIT Press, 2015. 288 pp.$32.00/£22.95, cloth. Bailey and Leonardi are leading ethnographers of work who acquired their reputations through meticulous fieldwork, comparative research designs, and insightful use of general themes emerging from the data to develop middle-range theory. All these qualities are demonstrated in this book, which summarizes a decade of research into the engineering profession, with an emphasis on product design work. The book compares the work of automotive design engineers, software engineers, and structural engineers; the technologies they choose to employ in their daily work; and the division of labor that structures their work. The book contributes to organizational literature in at least three meaningful ways. First, it provides an important description of design engineering work, highlighting its heterogeneity. Second, it identifies key factors that shape the choices engineering specialists make regarding their work tools. Third, it lays the grounds for a theory that can explain and even predict why and how occupations make decisions about the technologies they will use in their daily work. This theory is grounded in core elements of occupations, such as distinct skills and local divisions of labor, as well as in the surrounding environment, where variables such as market forces and institutional factors influence technological choice. You can read the rest of the book review from Administrative Science Quarterly by clicking here. Want to stay up to date on all of the latest content published by Administrative Science Quarterly? Click here to sign up for e-alerts! Andrew J. Nelson : The Sound of Innovation. Cambridge, MA: The MIT Press, 2015. 236 pp. $34.00, hardcover. The emergence of novelty—a new technology or organizational form, or even an entirely new field—has long been a central theme in research on innovation and technology evolution, organizational theory, and institutional entrepreneurship. That these diverse research traditions broadly share the same interest in the emergence of novelty is testimony to the importance of the phenomenon. Each research tradition is rooted in a distinct theoretical perspective and exposes specific mechanisms that are presumed to generate novelty, but deeper insight into the conditions that enable novelty to emerge and take hold stems from integrating those traditions and, possibly, reconciling their differences. For instance, the creation of an entirely new field can hardly be ascribed to the decisions and actions of a single actor (individual or organization) without also invoking features of the broader institutional environment that accommodated them and the social audiences or constituencies willing to provide resources to sustain those decisions and actions. A few attempts have been made to integrate these different research streams. The Sound of Innovation is a systematic effort to develop an interdisciplinary and multilevel account of the emergence of a new field—computer music—that should inspire other scholars to engage in similar endeavors. You can read the full book review from Administrative Science Quarterly free for the next two weeks by clicking here. Want to keep current on all of the latest research from Administrative Science Quarterly? Click here to sign up for e-alerts! The Globalization of Inequality. By François Bourguignon . Translated by Thomas Scott-Railton . Princeton, NJ: Princeton University Press, 2015. 224 pp. ISBN 978-0691160528, $27.95 (Cloth). In this book, he [François Bourguignon] has produced a concise and nontechnical masterpiece of exceptional analytical and policy clarity. His professional expertise and policy involvement shine through in every chapter. Although the book is written for concerned global citizens, professional economists and other social scientists can learn much from reading it. Bourguignon begins by posing some provocative questions. Is globalization responsible for rising inequality in the world? Does this represent the death knell for equality? If it continues, will the quest for social justice be squelched? 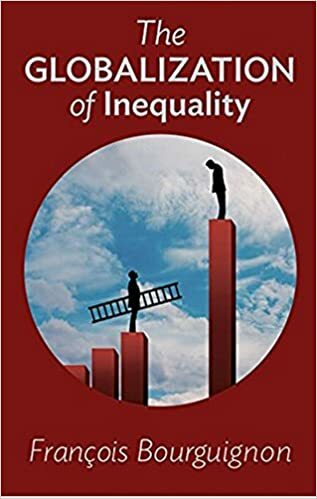 His analysis makes a crucial distinction between three types of inequality in standards of living: inequality between countries, inequality within countries, and inequality among the world’s people. It is the last of these—what he terms “global inequality”—that is his primary concern and is at the heart of the book. You can read the full review from ILR Review by clicking here. Like what you read? Click here to sign up for e-alerts and have all the research and reviews like this sent directly to your inbox!